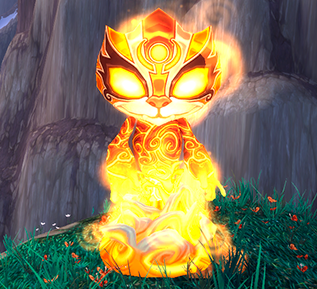 The Burning Pandaren Fire Spirit is located in 67,14. Her Team consists of Crimson and Glowey. 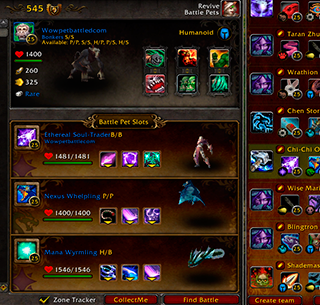 Your team : Anubisath Idol, Any Crab and any pet you want to level. It doesnt really matter because Anubisath is going to Solo all three of these pets! Let the battle begin! Crimson is a dragonkin. Start off with Anubisath and use crush. Your second attack will be sandstorm, even though hes in the air and it doesnt connect, it will change the weather and start negating damage. Use deflect next as crimsons liftoff resolves and misses you completely. Now just lay into him with crush till hes dead. Burning Pandaren Fire Spirit is an elemental. She starts off with immolate, so your deflect should be up. If it isnt, dont worry, her next attack is Cauterize, then conflagerate, so if its on CD for immolate, use it on conflagerate. Either way, either deflect or crush for the start of round 2. WHer next move is cauterize, followed by immolate then she stands there for 2 turns. so heres where you just keep wailing away with crush and sand storm, using deflect after every third attack, as that sher coll down process. it will always be an attack, cauterize, attack, cd, cd. crush spam till shes dead. Watch the video for clarification. Glowey is pretty much a giveme with the right tools. Start off with sandstorm. then deflect the toxin. When she goes into her swarm, switch to the pet your going to level. Sand storm completely negates any incomming damage fromthe swarm, as long as your pet is like over level 16 or so. if not it takes little damage. switch back Anubisath, and just sandstorm crush spam till shes dead, easy money!